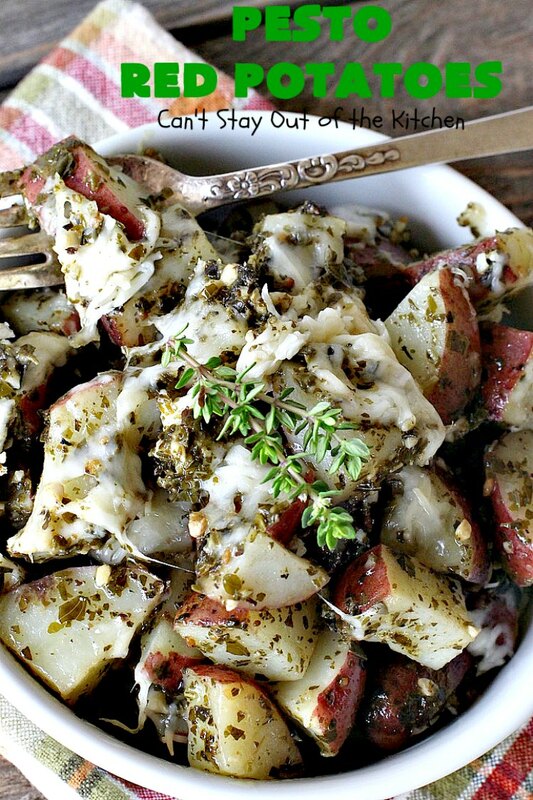 Pesto Red Potatoes are marvelous. Seriously, these are some of the most delicious potatoes you’ll ever eat. What’s not to like about potatoes with pesto sauce and lots of grated Parmesan cheese? 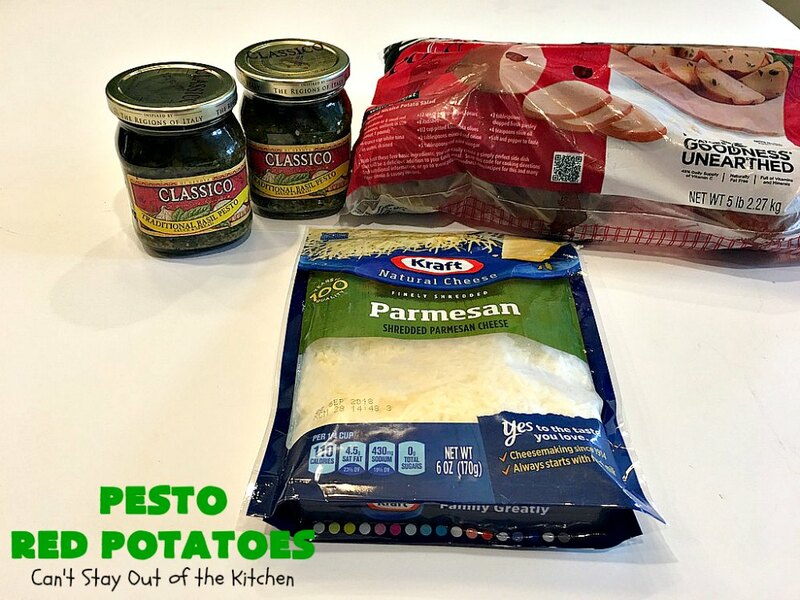 The lovely Pesto sauce and the cheese flavors these potatoes so that the recipe is downright scrumptious. No lies! 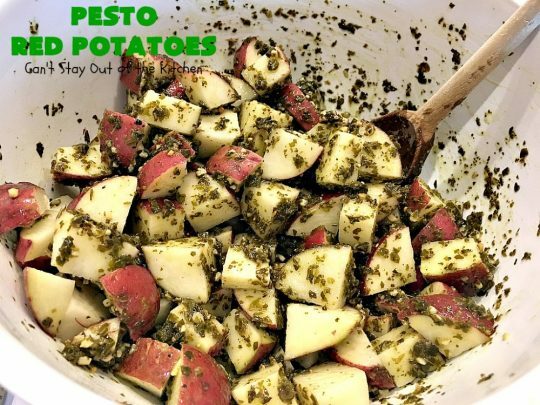 These potatoes are wonderful to the taste buds and with just three ingredients they are quick, easy and economical, too. 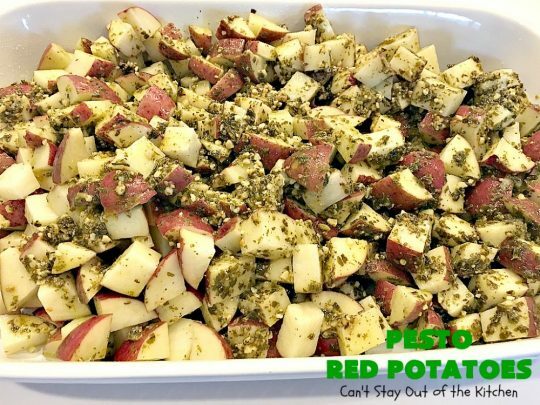 I had Pesto Red Potatoes oven-ready in under ten minutes because I left the peels on the red potatoes and only washed and cubed them. I served this casserole to a houseful of company and, without exception, everyone thought they were fantastic. 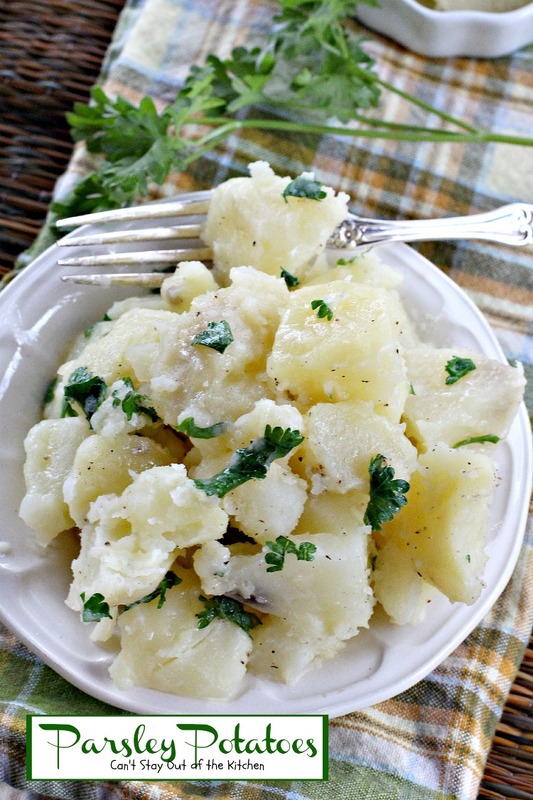 Granted, it’s hard not to like potatoes, but the flavors in this recipe are awesome. This recipe is healthy, low calorie and gluten free. I saw this fabulous looking three-ingredient recipe on one of the food blogs I follow on Bloglovin’ a few months back. I promptly pinned it because I knew I would want to make it sometime soon. Well, soon came five months later when I made it last week as a side dish. I served it as an accompaniment to Apricot Glazed Ham. I also included Cherry Tomato Cobbler, Baked Onions, Yellow Squash Casserole and some overnight homemade rolls. I love Pinterest but it’s really hard to pick and choose what to make sometimes since there is such a range of selection these days. 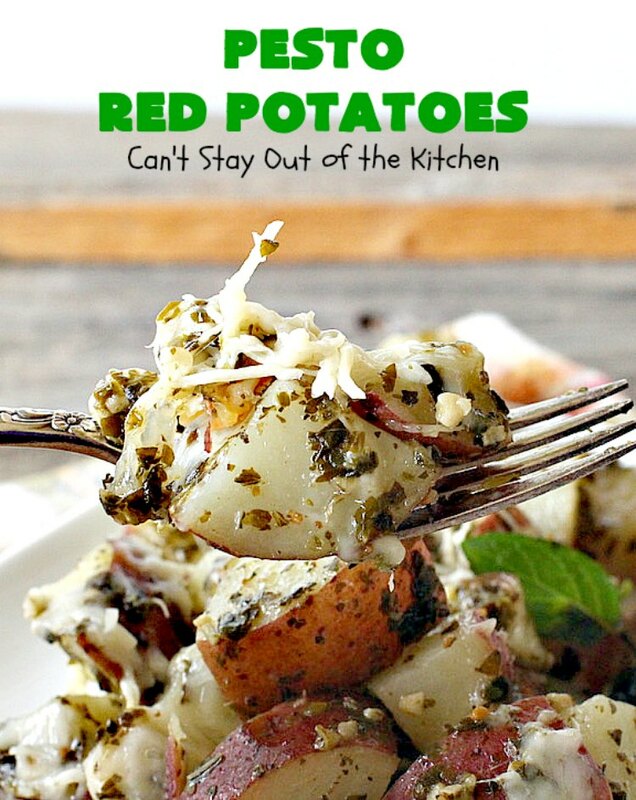 I really thought Pesto Red Potatoes would be tasty but they even exceeded my expectations. 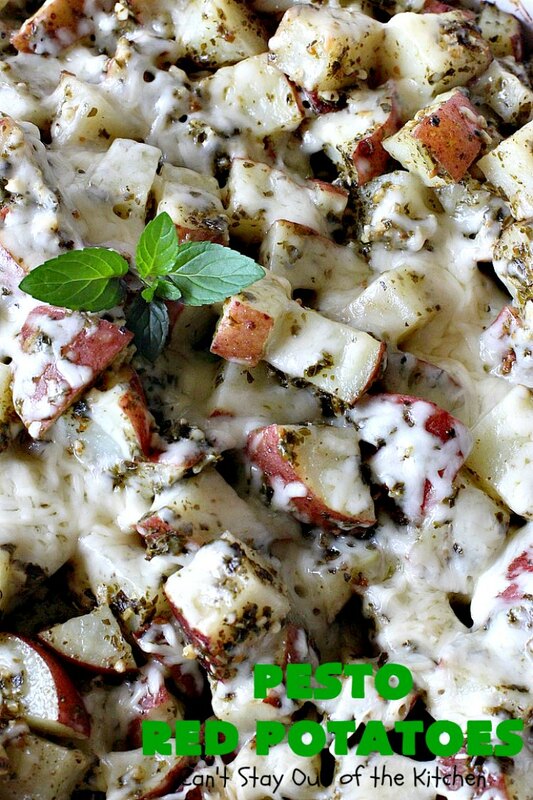 My guests and I all loved this sensational potato casserole recipe. 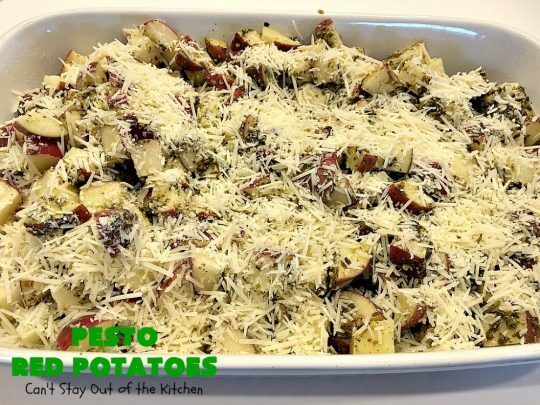 The main changes I made to the recipe were to use red potatoes instead of russet potatoes and I increased the Parmesan cheese. I think you will enjoy the changes. While I made a double batch for all of our company, this recipe can easily be halved and still make six ample servings. 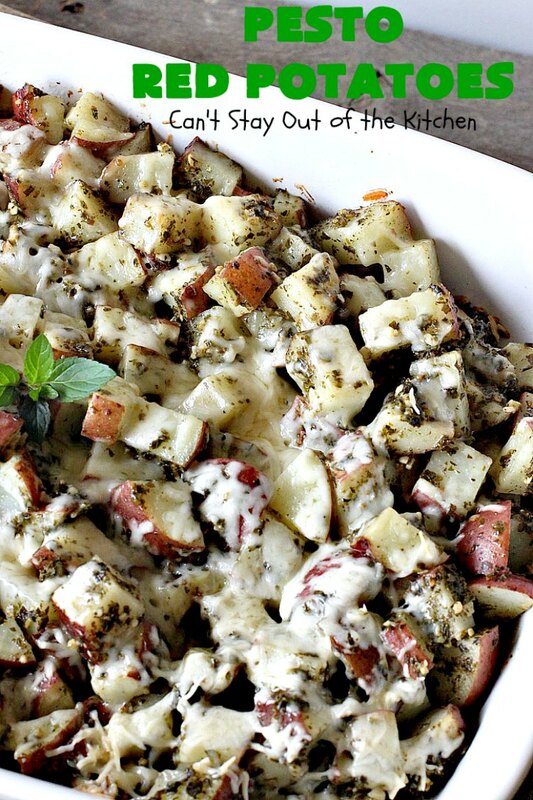 If you want E-A-S-Y than this is the potato casserole recipe to try. If you want F-R-U-G-A-L than this is the potato casserole recipe to try. If you want T-A-S-T-Y then this is the potato casserole recipe to try. If you have lots of garden potatoes that need to be harvested than this is the potato recipe to try. It’s a win-win all the way around with Pesto Red Potatoes. 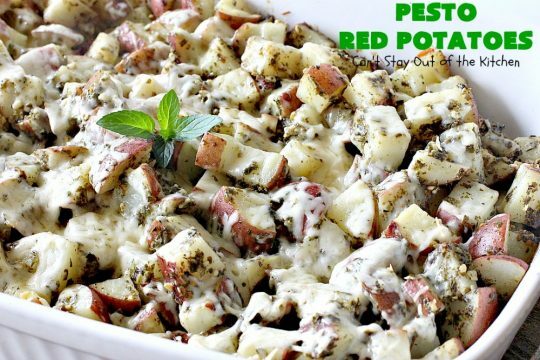 Every bite will tantalize your taste buds bringing you back for more, more, more….Moreover, these potatoes make excellent leftovers. I made them up into a spectacular Pesto Potato Soup. The flavors were awesome. I initially posted this recipe in October 2013. However, I was making so many recipes for a party I was hosting, that I didn’t take enough time to really get good pictures. I didn’t realize that until a few weeks ago when I was looking back through the recipe. I decided to remake it for our Friday night care group (circa May 2018). I served it with my favorite chicken dish: Parmesan Chicken Bake. I also made a new recipe called “Best Ever Slow Cooker Creamed Corn.” Without exception, everyone loved that meal! It was hearty, filling and so satisfying. 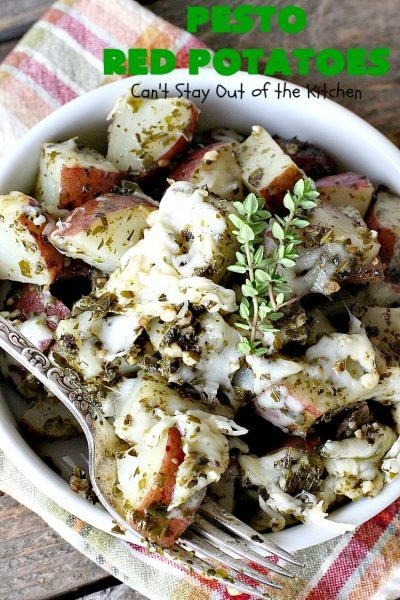 Pesto Red Potatoes are so pleasing and delightful. This recipe is so quick and easy to assemble that it’s really terrific for holiday or company side dishes. I highly recommend it for Easter, Mother’s Day, Father’s Day or even Thanksgiving or Christmas menus. After you try a bite, you’ll see what I mean. 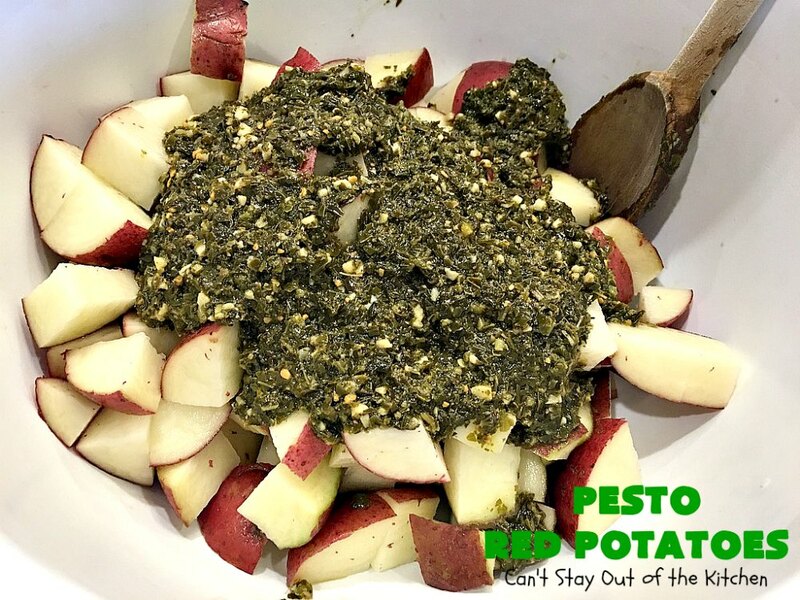 Pesto Red Potatoes are a succulent three-ingredient recipe! Here you can see all the savory Parmesan cheese on top. This recipe is so high on taste you would think you’d have to spend hours preparing it. Nope. This recipe can be oven-ready in about 5-10 minutes! 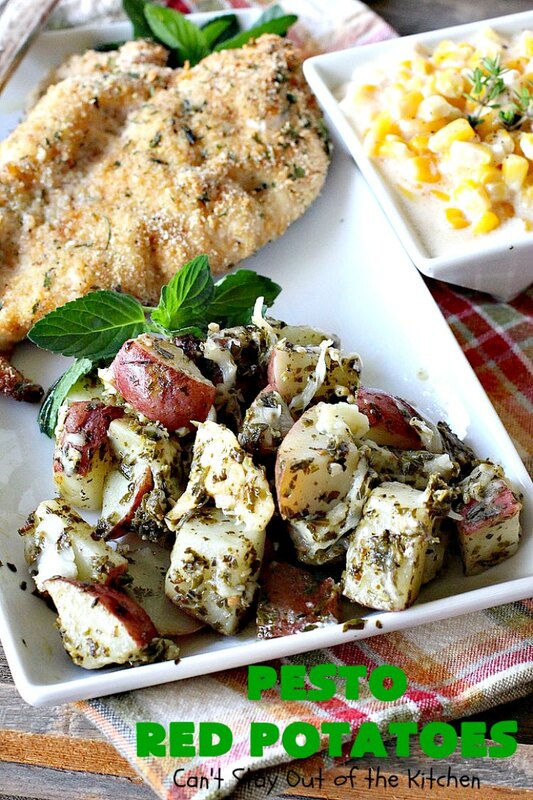 I served Pesto Red Potatoes with Parmesan Chicken Bake and an amazing slow cooker Creamed Corn. Wash red potatoes and cut in chunks. Because there are so many potatoes it’s easier to work with two separate bowls or make one batch at a time. Spray a 10×15″ baking dish with olive oil cooking spray. Place potato mixture into baking dish. 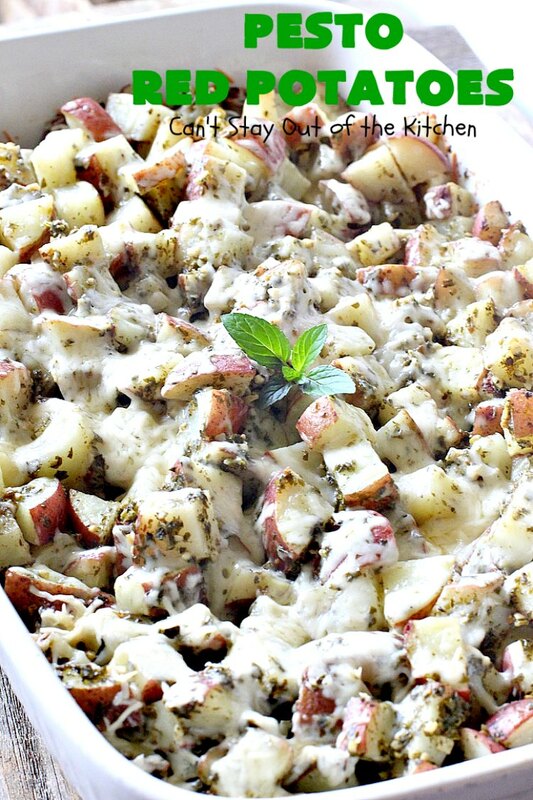 Cover with foil and bake about 45-60 minutes or until potatoes are fork tender. These potatoes were great served with Apricot Glazed Ham. They would work well with entrees like Grilled Rosemary Swordfish or Parmesan Crusted Chicken as well. The second time I made these, I served them with Parmesan Chicken Bake and Best Ever Slow Cooker Creamed Corn. Seriously, every forkful was heavenly. Since I made two batches of this recipe, I had enough left over to make a fantastic Pesto Potato Soup. Double the delicious pesto flavor! Don’t Pesto Red Potatoes look terrific? If you’re looking for a convenient and easy recipe for a potato side dish, Pesto Red Potatoes certainly fits the bill. We loved all the cheese. The mixture of flavors between the Pesto Sauce and the Parmesan Cheese was amazing. This recipe can easily be halved. I was cooking for a large dinner party so I doubled the original recipe, plus tweaked it a little bit. 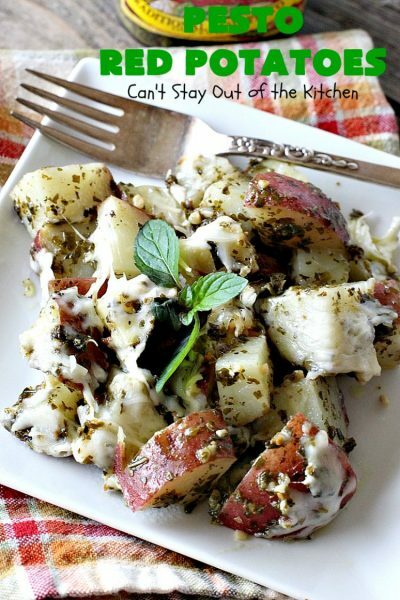 This fabulous 3-ingredient recipe uses red potatoes, pesto sauce and grated Parmesan cheese. This terrific side dish is perfect for company or holiday dinners like Easter, Mother's Day or Father's Day. It's healthy, low calorie and gluten free. It's also incredibly quick and easy to make and inexpensive for the pocketbook! Wash potatoes and cut in cubes. Place in 2 large mixing bowls. Pour a jar of pesto sauce over each and stir well. Spray 10x15” glass baking dish with olive oil cooking spray. Pour potatoes into the prepared baking dish. Bake at 350° for 45-60 minutes or until potatoes test done with a fork. NOTE: This recipe can easily be halved. Recipe adapted from Six Sisters' Stuff. 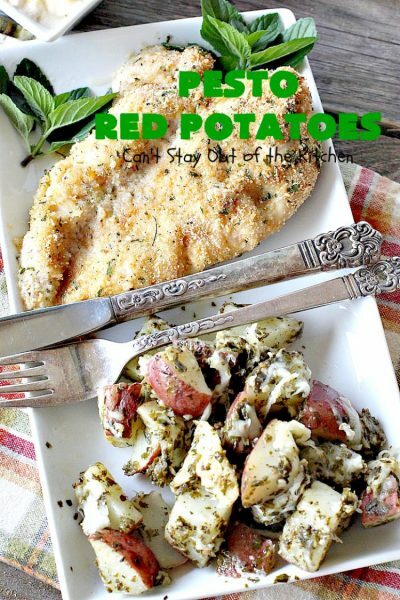 Fabulous 3-ingredient recipe using red potatoes, pesto sauce and grated Parmesan cheese. Healthy, low calorie, gluten free. Quick, easy, economical. Wash potatoes and cut in large chunks. Spray 9×13” glass baking dish with olive oil cooking spray. 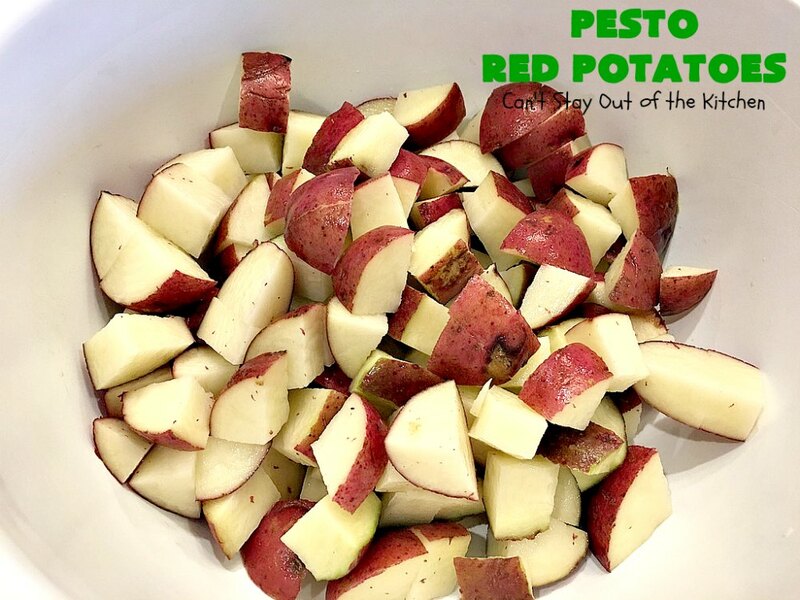 Pesto Red Potatoes are so delicious you will probably end up serving yourself a monster-sized serving like this! Our gang loved potatoes made this way. 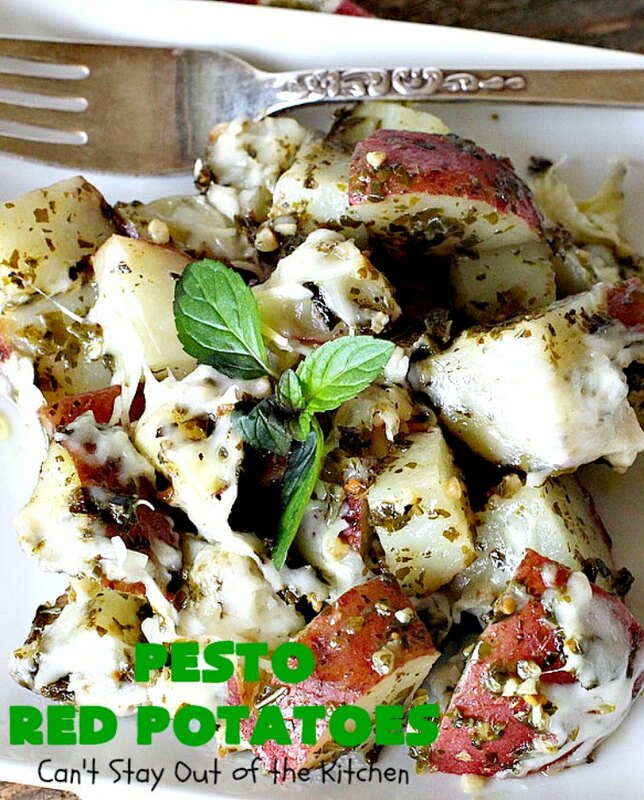 Pesto Red Potatoes are rich, savory, full of flavor. They’re also gluten free! Pesto Red Potatoes served with Parmesan Chicken Bake and Best Ever Slow Cooker Creamed Corn was incredibly good. We were all licking our lips after this amazing dinner meal. Another pesto lover here! I might try these with pecorino romano and see if I can get away with it. Sheep’s milk cheese is usually less problematic for those of us that have issues with dairy. Your potatoes look so good! I’m sure romano will work fine with this recipe and homemade pesto too!It sure is tasty! Thanks for stopping by. I make pesto every summer but never thought of using it on potatoes. These look so wonderful and would make a great dinner!! What a great idea Teresa! I just made some homemade pesto. These potatoes look so delicious and it would be a great way to use my pesto. Ooh! I just bought a jar of pesto. Wasn’t sure what I would do with it, but I have a very good idea now. Thank you, Teresa!